KAYAC has a unique salary system that cannot be found in any other part of the world. It is called the “Dice Pay” scheme. Every month, KAYAC’s members roll a dice to determine how much they earn. That said, the entire monthly salary is not determined by the roll of the dice. Each person is paid an additional sum calculated by the “basic salary + (number on the dice) %”. For example, if a member whose monthly salary is 300,000 yen rolls a 6, this person earns additional <300,000 yen x 6% = 18,000 yen> every month. This is often misunderstood, but the salary earned never decreases. Some people may say that it is inappropriate to decide a salary by rolling a dice. But our evaluation of others is not as precise as we think. There should be a reasonable explanation, but evaluation is very vulnerable to the impression your boss has on you. Then, wouldn’t it be okay to be somewhat playful about the payment scheme? It is important to see how we are evaluated in an objective way. But we do not have to feel discouraged because of evaluation by others. We humans have values that cannot be measured under capitalism. Ultimately, we let God take care of our evaluation and destiny. That is why KAYAC has implemented the Dice Pay scheme since its establishment. KAYAC has been made into a company that recognizes people who have fun working. The reason for this is that the evaluation system creates a company’s culture. “Dice Pay” is part of a person’s compensation, which means it is one of the company’s evaluation systems. If that is the case, what kind of company culture does Dice Pay lead to? We think the message behind “Dice Pay” is that it is an evaluation system that does not evaluate people. Working is all about evaluation. You cannot be trusted without receiving good evaluations from the colleagues you work alongside and customers. Work could be considered to be continuous evaluation. However, we think it is also valid to say people can’t have fun working if they are too concerned about how they are evaluated by others. We want KAYAC’s members to have fun working. The idea that we don’t want them to worry about how they are evaluated by others has been instilled into the “Dice Pay” system. We believe this evaluation system is a part of what makes The Fun-Loving Corporation’s unique culture. The evaluation system that doesn’t judge people – “Dice Pay” – is certainly a core aspect of The Fun-Loving Corporation. Smile Pay is a new salary scheme introduced in 2006 based on an idea from one of our members. We took a hint from one of Japan’s franchise chains that has a unique side menu – you can order a smile for the amazing price of zero yen. 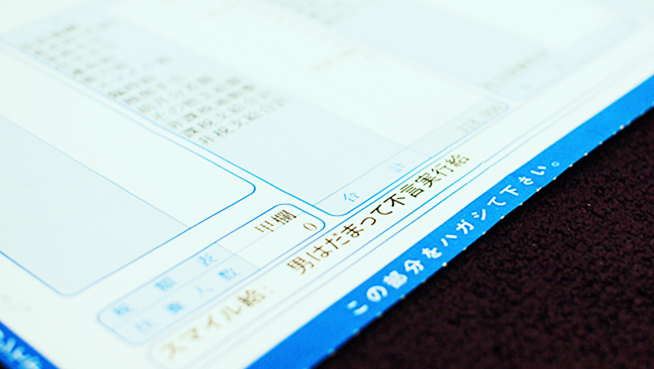 The actual amount we pay is for our Smile Pay is zero yen, too. The joy of working cannot simply be measured in terms of money. So, we try to compensate our members for their labor with something other than money. Here’s how it works. Every month, each member evaluates another member selected randomly. But the evaluation should focus only on his/her strengths. This means they compliment their colleagues. We call this system “Smile Pay” and they are shown on each member’s pay slip. The reasons for each person’s Smile Pay being named this way are published on the company’s Intranet. All members can view everyone’s Smile Pay. By looking at others’ Smile Pay, we often find new aspects of our colleagues. “I normally feel too embarrassed too embarrassed to say anything, but my colleagues see and recognize this aspect of me. I earn 0 yen, but it is priceless.” That’s Smile Pay. When all is said and done, money has a kind of magical power. We think Dice Pay is covered by the media so frequently because it has more meaning than simply being fun. We think they find it interesting because although the philosophy behind Dice Pay is that some things are more important than money, the system itself actually involves money. The same applies to Smile Pay. Rather than simply offering each other compliments, we think it is made more effective by stating that each member gets 0 yen for that aspect at the critical timing of when they open their pay slip. You could say that Dice Pay and Smile Pay are both challenging initiatives that take advantage of this magical power of money to make the world more fun.